Charlie Zammit was born on November 1, 1944. He kicked his first ball with Ħamrun Rovers, Ħamrun Democrats and Ħamrun Eagles in amateur circles before joining Birkirkara FC in 1962. Zammit came from a noted football family. In the 1940s his uncle, Ġużi Zammit, was a popular centre-half with Ħamrun Spartans, Valletta and the MFA XI. Charlie Zammit made his first-team debut for the Stripes on January 5, 1963 in a 1-2 defeat to Sliema Wanderers. That season, he played four league games for Birkirkara. However, when Birkirkara were relegated at the end of season, he won a permanent place in the team and in the year that followed he played in all second division matches. In 1964-65, Zammit left Birkirkara to join Ħamrun Spartans. He made his first-team debut for the Reds on October 24, 1964 against Valletta. Ħamrun lost 0-4 on that occasion but Zammit played well enough to keep his place in the team. That season he played 12 times in the league and scored two goals. His first goal came on November 28, 1964 in a 1-0 win over Gżira United. The mid-1960s were difficult years for Valletta. The team that had given so much joy and satisfaction to their faithful at the start of the decade was ageing rapidly and changes needed to be made to bring the team up to its former glories. The road was long and bumpy and it took time before results started coming. Valletta badly needed a quality striker and they set their sights on Zammit. He eventually joined Valletta in the summer of 1965 and soon settled into the team. Zammit stayed for four seasons with Valletta in which he played 47 first-team matches and scored 11 goals. Zammit could not have chosen a better game to make his debut for Valletta. On October 23, 1965, the Citizens lost 0-2 against their eternal rivals Floriana. With Valletta, Zammit won two Cassar Cup medals. The first was in 1966 when Valletta beat Sliema at Manoel Island. The Wanderers dominated that season. They won the championship and the MFA Cup and were hot favourites to add the Cassar Cup to their collection. However, their plans were foiled by Zammit who chose this occasion to play the best ever game of his career. Zammit scored a hat-trick and virtually won the game on his own for the Citizens as Joe Cini replied for Sliema. Valletta’s second Cassar Cup triumph came in 1968, once again against Sliema Wanderers. This time the Citizens won 2-1 and Zammit was again among the scorers. His goal made football history because it was the last one scored in the competition before it was stopped for good. 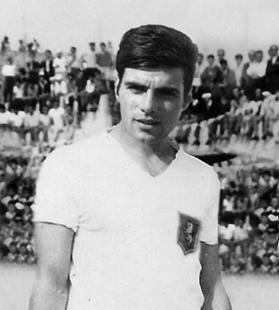 In the summer of 1969, Zammit moved to Żebbuġ Rangers. That year he helped the team secure promotion to the first division but at the end of the season he retired.